Sintering of iron ore is a metallurgical process carried out on a sintering machine. It is basically an agglomeration process achieved through combustion. In this process air is sucked at the sinter strand through a bed of raw mixture (also called sinter mix) of iron ore fines, limestone, dolomite, sand and quartzite fines (flux), solid fuel (coke breeze or anthracite) and metallurgical wastes (collected dusts, sludge and mill scale etc). The iron ore is natural ore of size 0 mm to 10 mm. This sinter mix is added with water and the return sinter fines and then granulated or pelletized in a rotating drum before it is charged as a bed on to the moving strand of the sintering machine. As the strand moves forward, the fuel particles on the top surface layer are first ignited in a furnace and as the strand move forward, the ignited or combustion front proceeds gradually downwards through the bed until the end is reached. Strand speed and sucked air flow are controlled to ensure that ‘burn through’ (the point at which the burning fuel layer reaches the base of the strand) occurs just prior to the sinter being discharged. The temperature of the sintering process is mainly controlled by the combustion of the fuel particles. During the process of sintering, there are different zones on the sinter machine strand. These zones from the charging side are wet zone, preheating and drying zone, combustion zone and product zone. In the combustion zone liquid phase is formed between iron ore, flux and other elements and the unreacted iron ore particles are bonded together by the liquid. The final product ‘sinter’ is a porous solid material having certain strength. There are several factors which affect the process of sintering, productivity of the sinter machine and the quality of the sinter. Major amongst them are given below. Effect of iron ore fines quality – In the sintering process main raw material used is iron ore fines, Quality of the iron ore fines influences the process of sintering to a great extent. An increase in the mean size of the iron ore fines promotes the productivity of the sintering machine, saves the specific fuel consumption but reduces the sinter strength. Dense low alumina iron ores gives a better sinter strength and lower specific fuel consumption. Very high level of microfines in the ore decreases the granulation efficiency and, consequently, decreases the bed permeability and affects productivity of sintering adversely. The iron ore porosity has effect on the sinter porosity and its physical and metallurgical properties. Iron ores with high loss on ignition affects the sintering process in a negative way by reducing the productivity, increasing the specific fuel consumption and reducing the sinter strength. A higher percentage of silica in the sinter mix counters the effect of high alumia in th ore. It is always desirable to have alumina/silica ratio in the sinter mix as 0.5 or below. Alumina plays an important role in reshaping and coalescing process during the sintering process by changing the physiochemical properties of the primary melt. This leads to a unique sinter pore structure. It has been seen that the pore area increases drastically and the pore shape becomes more irregular as alumina increases from 1.6 % to 2.4 %. There is a tendency of increase in the reduction degradation index (RDI) of sinter above a certain alumina content. Effect of flux – In sinter mix lime stone or lime and dolomite or calcined dolomite are added as basic fluxes while sand or quartzite fines are used as acidic fluxes. The fluxing oxides in the sinter are to modified the blast furnace (BF) slag chemistry in such a way so as to have desired characteristics of the BF slag. Basic fluxes added to the sinter mix in the form of lime and calcined dolomite also act as a binder in the sinter mix and improve the fine particles agglomeration. They improve the productivity of sinter machine and reduce the specific solid fuel consuption. Size distribution of fluxes is important for the sintering productivity. Adequate size distribution (low dispersion, hih average particle size) allow for higher sinter bed permeability and consequently higher sintering process productivity. Higher mean size of the sinter feeds normally allow for higher permeability of the sinter bed. The sintering performance depends on the efficiency of the mixing of the components of the sinter mix and granulation of the sinter mix in the mixing drum. This activity carried out in two mixing drums then being carried in a single drum gives better performance with respect to permeability of sinter bed and hence results in improvement in sintering productivity. The sintering mechanism consists of two different phenomena namely physical phenomenon of heat transfer from the top layer due to the bottom layer due to the action of the sucked air passing through the bed and chemical phenomenon of fuel combustion generating heat and a chemical reactions front. These two phenomea are independent and should have the same propagation speed to ensure maximum flame temperature. The equilibrium between these two phenomena is imporatnt for the high performance of the sintering process, low specific fuel consumption and high quality of sinter. The sintering bed needs a good permeability for the air to be sucked trough the sinter mix. A good permeability of the sinter mix will ensure a high strand productivity and a proper efficiency of the solid fuel burnt. Moisture of the sinter mix plays an important role in the granulation process and hence affects the sinter productivity. Moisture forms liquid bridgs between particles for beginning the granulation process. Capillary forces are responsible to decrease the distance beteen the particles and increase the granules resistance. Moisture content is to be optimum since the excess of moisture has a harmful effect on the granules and on the sinter bed permeability and stability. Effect of moisture on the granulation process is shown in Fig 1. The segregated blend loading system for loading the sinter mix on the sinter machine strand helps in the permeability of the mix and hence in improving the machine productivity. 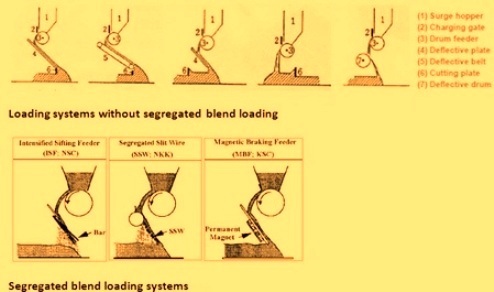 Fig 2 shows charging systems without segregated blend loading system and different types of the blend loading systems. Ignition system – The time and temperature of ignition is essential for proper progress of the flame front and a proper sinter quality. Excess of ignition causes decrease in bed permeability and the metallurgical properties of the sinter. This increases the generation of return fines and hence the productivity. The use of multi slit burners improves the ignition efficiency and reduces the ignition energy by around 30 %. Type of solid fuels – Solid fuels of very low reactivity or very high reactivity promote difference between the front of combustion and heat transfer. A suitable size distribution of solid fuel is necessary to optimize the sintering process. Automatic process control improves the sinter machine productivity. This technology results into savings of 2 % to 5 % energy consumption. Installation of emissions optimized sintering reduces solid fuel consumption in the range of 6 to 12 Kg per ton of sinter. Optimum mean size of iron ore fines for good sintering process will vary from sinter plant to sinter plant since it is dependent on several factors but as a general rule higher mean size is better for permeability and hence helps in sintering productivity. Moisture holding capacity will depend on the characteristic of iron ore fines and it will be different for different ores. However moisture content of the sinter mix is to be kept optimum for better granulation. What are the advantages of sintering over pelletisation ? Sintering and palletization are two different processes of agglomeration. Major advantages of sintering process are (i) Sintering uses as mined iron ore fines which can be used as such without further activity of grinding (ii) Sintering can use a very amount of waste materials (iii) Sinter can be made with high basicity thus eliminating direct charging of limestone and dolomite in blast furnace.